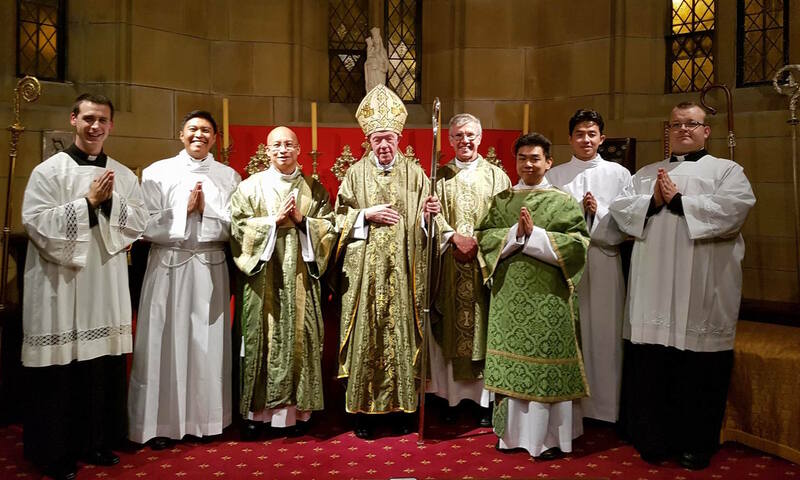 L-R: Benjamin Gandy, Darren Caballero, Gerard Woo Ling, Bishop Terence Brady, Fr Danny Meagher, Sebastian Hew, Adi Sugiarto, Adrian Simmons. On the eve of Sunday, September 18th, 2016 the 24th Sunday in Ordinary Time at St. Mary’s Cathedral four seminarians from the Archdiocese of Sydney were installed into the Ministries of Lector and Acolyte. Adi Sugiato, and Darren Caballero were installed as Acolytes. Benjamin Gandy and Adrian Simmons were installed as Lectors. Most Rev Terence Brady, Auxiliary Bishop of Sydney presided over the installation. Lectors proclaim the Scriptures at liturgical celebrations and serve as catechists; acolytes serve at Eucharistic celebrations and bring the Eucharist to the sick. In the rite, each candidate is handed a symbol of the ministry to which he is being instituted, a Bible or a Ciborium with bread for their respective ministries, as the presider exhorts the men to fulfill the ministry faithfully. Institution to these ministries are steps on the journey toward priesthood. We ask for your continued prayers for all of our seminarians and especially these newly installed lectors and acolytes that they may faithfully fulfil their ministries and continue to persevere in their journey to the priesthood.